Check with your child’s school to learn which assessments are given and how much time is dedicated to them. 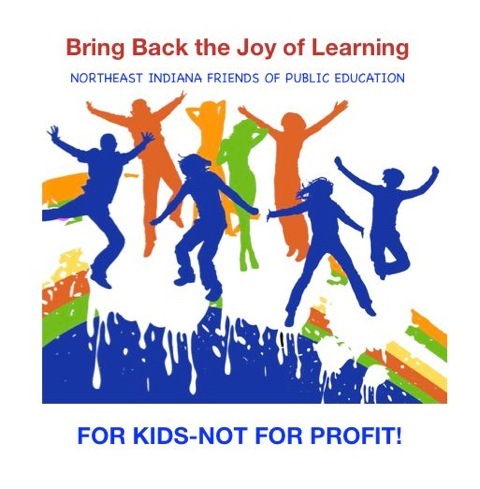 The Indiana Department of Education estimates the cost of testing to be $46,229,751 for the 2012-2013 school year. What will be the cost of testing in time and money when the 2014-2015 implementation of the Common Core Standards adds additional tests? As parents, educators, and concerned citizens, we think there are a number of questions that should be considered about high stakes testing. What do we want children to learn? What do they really need to know? Is standardized testing the most effective way to measure student learning? What teaching methods are developmentally appropriate to promote learning? Should we teach children how to learn, how to think, and how to question? Do current policies encourage the education of every child? What are the Common Core Standards and how much testing will be involved? What are the implications of these standards for your child? Should standardized test results be used to evaluate teachers? How much money is being spent on standardized tests? Click HERE to download a copy of this pamphlet or see all our fact sheets under INFORMATION AND FACT SHEETS in the right hand column of this blog. Testing is also done in the 7th grade. I expected it to be alot but not 46 million! Thanks for the correction, Amanda.